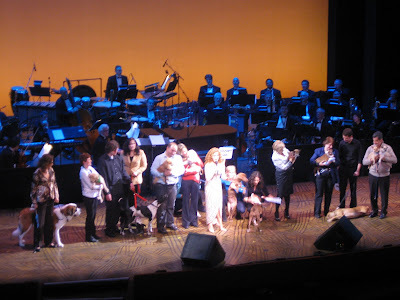 Last night at the Minskoff Theatre, usually home to The Lion King, Bernadette Peters returned to the Broadway stage in a one night only concert benefiting Broadway Barks and Broadway Cares. 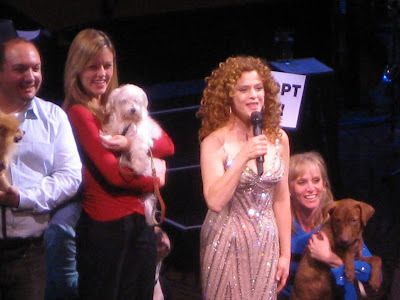 Eleven years ago, Bernadette officially began supporting no-kill animal shelters and the promotion of animal adoption when she and Mary Tyler Moore founded Broadway Barks. Bernadette has taken this commitment to heart as she has not only provided her celebrity status to the cause and even written a children’s book titled Broadway Barks, but even takes the time to drive from pounds to no-kill shelters, rescuing animals from imminent euthanasia. It was a night of sparkles – at least 15,000 to be exact. Bernadette wore a purple sequined gown by her signature designer Bob Mackie. In the second act, she wore another new Bob Mackie number, this time covered in 15,000 Swarovski crystals. She noted that she has an additional 1,000 in a bag in case she loses a few...no doubt she did last night with all the dancing, prancing and cavorting she was up to! The concert began with the slightly and appropriately re-written Into the Woods prologue. Original cast members Merle Louise, Joy Franz, Kay McClelland and Lauren Mitchell recreating their roles as Cinderella's Mother, Stepmother and Stepsisters and Mary Tyler Moore, as the narrator, arose dramatically on an elevator from below the stage. Then thrillingly, draped in a cape, Bernadette arose. She simultaneously and quite hysterically played Cinderella and the Witch and several other characters when necessary. Bernadette and Mary shared a little history of Broadway Barks and some mutual admiration. Then immensely pleasing the audience, Bernadette segued into the theme song from the Mary Tyler Moore Show, Love is All Around, encouraging us to sing along. She even had a beret for Mary to toss into the air. Now, Bernadette launched into a fabulous two act concert, filled with much Sondheim, some Rodgers & Hammerstein and a few standards. She said that she always sings Sondheim in concert, but had missed some beautiful songs along the way: “And tonight I remedy that.” She sang two numbers from Follies – In Buddy’s Eyes and Losing My Mind. While "In Buddy’s Eyes" was a oddly arranged and perhaps too slow, her rendition of Losing My Mind was perfect. She also added Goodbye for Now, from the soundtrack of Reds, which Sondheim also wrote. The moment that did me in was at the bottom of Act I. Bernadette sang Some People from Gypsy. Hearing and seeing her perform that song is what made me fall in love with her to begin with. I had not heard her do that since May 30, 2004. It was absolutely thrilling and I admit that I was quite moved to tears. Once she got back to the business of singing, she never missed beat. Her energy on stage is unmatched, and Bernadette always inhabits each song, whether it’s a love song or of comedic nature. Some moments will practically break your heart – in this case Not a Day Goes By – and then she thrills you like no other with Johanna. A very special song inclusion was a tender reprise of Children and Art. Bernadette sat for this, covered in shawls, just as she was Marie in Sunday in the Park with George. She followed that with Being Alive. If this was all, it would have been enough. But she had to do it – she did the Turn. Earlier in the evening, she had introduced in the audience Margaret Styne, Jule Styne’s widow, Arthur Laurents and Stephen Sondheim. She called them – Styne, Laurents, Sondheim – geniuses. She talked about what inhabiting that character of Rose in the greatest musical meant to her as she put on a sweater and changed into more sensible pair of heels. She then went directly into the monologue before Rose’s Turn, which she proceeded to knock out of the park. 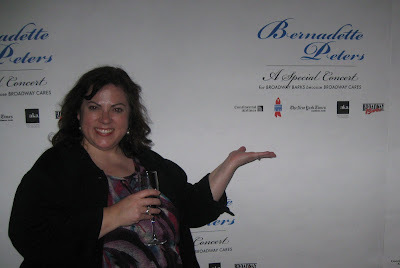 I later told Bernadette, at the celebration at Blue Fin, that it was her best concert I had been too, and that was saying something since I had been to a lot. I successfully elicited a laugh from her. Hopefully, we won’t have to wait another five years before she returns to Broadway, where she belongs. Her Children and Art broke my heart! Highlight of the evening for me! Such an amazing evening. Each moment making me realize just why I am a fan of Bernadette Peters. Also what a treat to hear some new songs, as well as some we haven't heard for a while. ;) and let's not forget her attempts at selling her Florida vacation home. She got a chuckle out of me each time she mentioned another feature of the house. Wow. Thanks, Sarah. Beautifully detailed account of what sounds like an unforgettable evening. Viva Bernadette! So hysterical! Six bedrooms, five baths... Turtles lay eggs in my backyard. My mom got a kick outta that story! Bernadette started trying to sell her house from stage as early as February, 2008, if not earlier. Noah and I heard her pitch at the Staller Center in Long Island...then again in August, 2008, in Philadelphia...and then again in April, 2009, in Boston. She also does that Eli Wallach joke - keep the house joke, but please, please lose the Eli Wallach. I've been trying to sell my place in Florida for three years. Good luck with that! Values keep dropping.